The First Lady heads over to a hospital to spread some of her special charm and diplomacy. 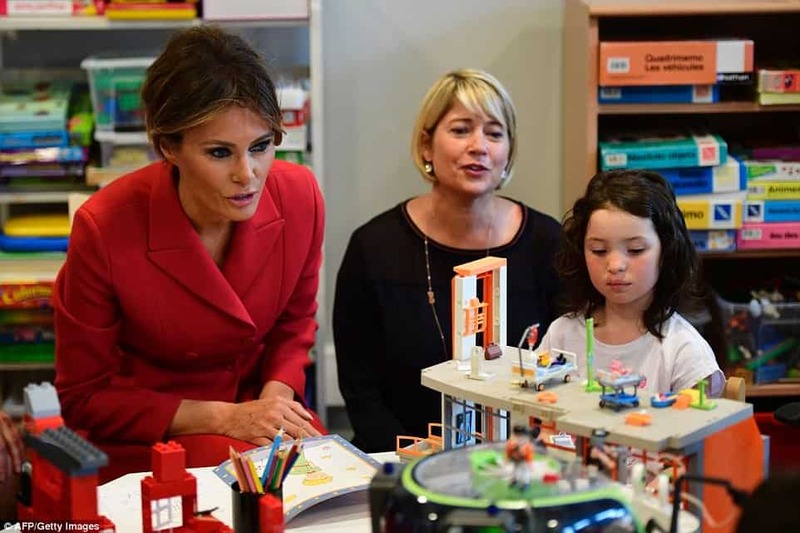 Big Red Car wants to know: Is it a coincidence that the First Lady is wearing a Big Red Dress? No, it is not, dear readers. Big Red Cars like Big Red Dresses. Though, I will be the first to admit she wears it better than a Big Red Car does. Haha. That was a joke, y’all. At the hospital, Mrs. Trump spoke in both French and English cause she speaks five languages. Of course I speak French. Doesn’t everyone? And German? And English? And Serbian? And Slovenian? So, dear readers, there you have it — America’s secret weapon, Melania Trump. But, hey, what the Hell do I really know anyway, I’m just a Big Red Car. This entry was posted in Melania and tagged first lady, france, melania, President Trump, Trump. Bookmark the permalink. Now that she is well into her First Lady work, she looks both really happy with it and really good at it. Usually when she is with children, her face lights up with a few megawatts of power from somewhere; she looks like she suddenly is in another and much better world and seems like she is walking on air. I’m really proud of our President, First Lady, and First Daughter. We dodged a very serious bullet and much worse and are very, very lucky to have such a determined, capable, dedicated patriot to pull us out of some really dumb, costly, stupid stuff going way back and by a thin thread save us from much worse that we nearly fell for. Someone needs to collect the top, worst 10% of the statements of the NYT-MSM, Democrat, Goebbels style (repeat a lie often enough and people will believe it) despicable, lying propaganda, complete with solid references and full quotes, of the last two years about Trump and just keep that around for when, finally, enough citizens have become highly impressed with Trump and are ready to respond to that record, with overwhelming anger and determination, driving NYT-MSM flatly out of business for good. Gingrich seems to believe that this civil war of the NYT-MSM, Democrats on Trump will just continue. I don’t think so: I believe that Trump can win this one, and his victory will be a lot of the NYT-MSM going flatly out of business. Going to Poland and in front of that WWII monument and emphasizing Western Civilization and God, country, and family should impress nearly everyone and be something on the walls of K-6 classrooms across America. The people in the US appreciate Western Civilization and God, country, and family, and the people, the ones who don’t want to kill us, who want to come and live here want to be here because of Western Civilization and God, country, and family. Not all civilizations on this planet were created or are equal. To me, Western Civilization is by huge leaps and bounds the best. Might as well go for the best. For other civilizations, most of just how Western Civilization works is plenty well enough documented and illustrated; there’re no patent rights to buy; all the details are for free; we have no monopoly; anyone is free to copy. And for God, country, and family, what could be better than those? When people realize that the NYT-MSM have been lying to them so badly for so long, they can get really PISSED. In many ways, Pres Trump has already won. He has injected the term “fake news” into the lexicon and has attached it around the neck of CNN, NYT, WashPo like a pork chop with the dogs of war chasing them. The NYT was the most venerable franchise in media for a century and it is now at the bottom of the bird cage like a liner. That is a pretty significant fall from grace. They even changed their motto to something like, “We Spew Crap in the Darkness.” I may have gotten that wrong. When Pres Trump went to Poland, there was only ONE speech which was reported by the international press and it was his. To suggest that he does not own the spotlight, set the agenda, control the discussion requires a special kind of animosity. Pres Trump owns the real estate between the ears of the media. Period. > Pres Trump owns the real estate between the ears of the media. Period. So, that’s what that victory looks like: Joe and Mika, etc. just spew crap about Trump, but about all they can talk about is Trump. Hmm. To me, for the NYT and WaPo, printed on paper they can’t compete with Charmin. On the Internet they are useless for wrapping dead fish heads. is the worst they have to print on Trump when they really have nothing bad on Trump to print. The good news about the savage lies of the NYT-MSM, Democrat, Goebbels style propaganda is that — for all their efforts on his hair style, his speaking style, the wild, from smoking strong funny stuff guesses about a Russia connection — the worst that has any credibility is something about two scoops of ice cream. So, that propaganda is giving Trump high praise from the faint damnation. Right now, as the NYT-MSM, Democrats dig for dirt on Trump, they just turn up more dirt on Hillary and Obama. On the one hand, there’s Trump, the most powerful person in the world. On the other hand there’s Mika, Joe, Maddow, and the highly self-esteemed, formerly highly revered, “failing NYT”. BRC has a serious crush! You Headlights are fogging up! 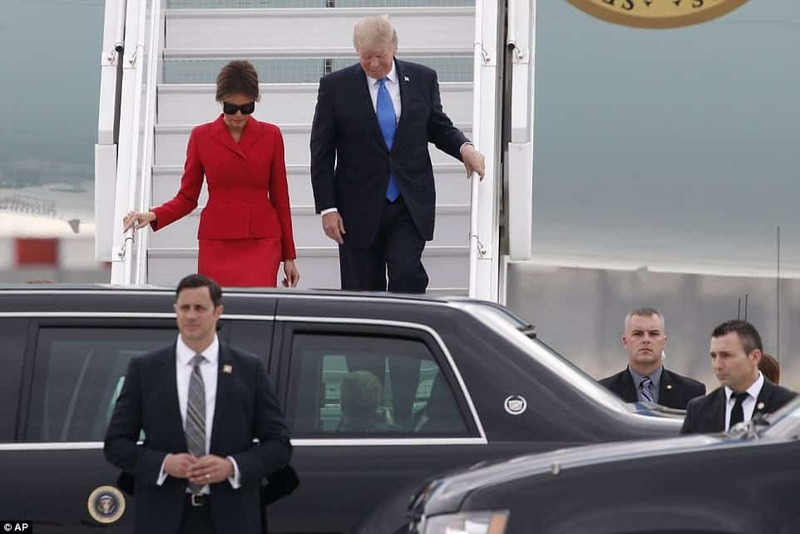 Yes, I think the Big Red Car is sweet on Melania. Me too. Don’t tell the wife! Let’s see: It appears that whenever Melania wears a dress, pair of shoes, coat, etc., the next day the stores, e.g., Neiman-Marcus, all sell out. In that case, does Melania have to pay list price? Melania Trump is America’s First Lady and secret diplomatic weapon.